The musical Sugar Babies was a very unique enterprise: it was a star-driven revue and tribute to the era of burlesque. Bawdy sketches, numbers and routines – both old and new – made up the evening which starred MGM stalwarts Ann Miller (Occupation: STAR!) and Mickey Rooney (in his Broadway debut). “The show was well received by critics and audiences alike; a genuine crowd pleaser whose sole purpose was pure entertainment; a sort of final farewell to the long dormant genre. There was some skepticism about the show from insiders and outsiders and it wasn’t expected to be a sell-out smash, but that’s exactly what it became. The musical opened at the Mark Hellinger Theatre in 1979, and settled in for a three year run, clocking in at 1208 performances; the final success to play the house. (During the 80s, there was one flop after another until the Nederlanders sold the building to the Times Square Church in 1991). Miller and Rooney headlined the Broadway production for its entire run and later toured. He only missed one scheduled performance during his seven years performing the show. His understudy never went on; when he vacationed during the Broadway engagement, Joey Bishop, Rip Taylor and Eddie Bracken were brought in to cover. As for that one performance he missed on tour? The producers just canceled it. (The first national tour starring Carol Channing and Robert Morse was short lived). After seeing both this production and the import of Hamlet last year, I will gladly see anything the Donmar Warehouse wants to bring to NY. Had the powers-that-be not bungled the whole idea of a “Best Replacement Tony” a few years back, I would readily nominate the new cast of God of Carnage, who started performances last night. The mere fact that I want to shower them with such accolades after merely one paid public performance should be enough evidence of how thrilling this new quartet works in Yasmina Reza’s study of good intentions gone awry. The play has been running for a year, opening to rave reviews with a cast of stars who turned the play into a sell-out event, breaking house records and winning Tonys, etc. I saw the show last May, just before the awards hoopla ensued, and had a ridiculously good time from my seat in the rear mezzanine. (Thanks to KariG, we were in the front row). I hadn’t planned on taking in the show a second time, sometimes once can be enough. However, when it was announced that original London star Janet McTeer would be reprising her role of Veronica (Veronique in the French-set London production), I was suddenly interested in a revisit. I’d fallen in love with this imperious talent during her acclaimed run of Mary Stuart opposite the estimable Harriet Walter last season, and am willing to hear her read the phone book. I had rumors that she was coming into the NY production, and was curious to see what her performance was like. McTeer was preferred by many friends who saw both the original London and Broadway companies. I was also intrigued at how she would fit into this Americanized version of Reza’s play. Rounding out the company was Dylan Baker as Alan, Lucy Liu as his wife Annette and Jeff Daniels (the production’s original Alan) as Veronica’s husband Michael (originally played by James Gandolfini). Watching the play this time around, I was most taken with how playwright Reza keeps the actors (mainly Alan and Annette) in the living room for the play’s 90 minutes. This is especially more of a challenge as the play progresses, rum is served and verbal and physical assaults ensue. The couples have gathered because their sons were involved in a playground scuffle and hope to settle the incident in a civil manner, avoiding law suits and insurance claims. McTeer dominates the stage. She is a natural presence; a living, breathing creature who unravels in front of her husband, two strangers and the entire house at the Jacobs Theatre. Her performance is simply tremendous, and I will admit a slight preference over Harden’s (whom I loved). She is so fascinating to watch in performance, it’s almost impossible to take your eyes away from her. I’ve rarely seen an actress who can be simultaneously gut-busting hilarious and tragic, and on top of it, McTeer makes it look so effortless. Liu is making an auspicious Broadway debut as Annette; it was a delight watching her progress from an apologetic, sickly simp to a drunken Martha-in-training. Hers was the most surprising and unexpected performance, and I only hope she considers frequenting the NY theatre scene more often. She is especially memorable in her drunken monologue where she discovers her long-dormant confidence and unleashes her fury with $80 worth of imported tulips (seated in the front row, we got splashed – Kari even got a glass stone in her lap!). Onto the men – Alan is a tailor made role for Baker: stringent, bored, clearly inconvenienced to be dealing with Michael and Veronica, as well as his own wife. Jeff Daniels was another curiosity – having played Alan so successfully, how would he transition into the other role? Quite brilliantly. It’s a testament to his versatility as an actor he can portray the two antithetical leading men in the same production without so much as blinking an eye. There is nothing in his Michael that even remotely suggests his disconnected, sardonic performance as Alan. Putting all four together in that savagely blood red living room, it becomes something of a volatile game of doubles tennis. The two couples are innately juxtaposed, but things get interesting as allegiances shift among the quartet, exposing unpleasant truths about both marriages – which only provides more ammunition for the onslaught. Nothing amuses me more than watching characters shattering false illusions about themselves while completely falling from grace (and it is Veronica who has the farthest to fall, as she grasps onto notions of morality and humanity dismissed by the other three). The play is still fiercely funny from start to finish, much of that credit is due to Tony-winning director Matthew Warchus (who hit two home runs last season with Carnage and, more impressively, the revival of The Norman Conquests). If you haven’t seen the play, yet, by all means, run! If you have, rest assured that the production is in excellent hands and worthy of a second glance. "Like Shiloh and Valley Forge…"
The sublime revival of South Pacific is poised to end its run at the Vivian Beaumont after a monumental 1,000 performances this August. I’ve seen the show twice; once on its opening night and the other on the night Barack Obama was elected our President. The production is a personal favorite of mine, and I hope to make another trip back before it ends. The musical is based on the collection of short stories by James A. Michener, and there are two simple references to the original text. They are quotations which bookend the book’s introductory chapter which are projected onto white scrim; one before the overture, the other after the curtain call. 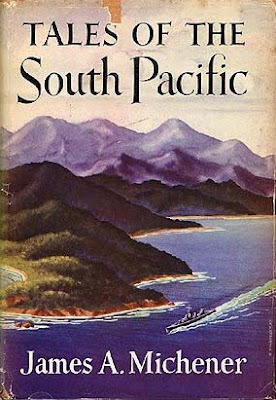 We have had an old mass market paperback edition of Tales of the South Pacific lying around the house for years. I got it in elementary school, but I didn’t read it until 2005, a result of seeing the concert at Carnegie Hall. It’s a collection of tangentially related short stories all revolving around Operation Alligator, a fictive military operation which took the restless Seabees and sailors out of their restless waiting and into the heart of the Pacific theatre of WWII. I couldn’t put the book down, I was fascinated – as I always have been and always be – with the history of the Second World War. I can’t say that I grew up as a military brat, as my father (a Marine, once and always) left the military more than 20 years before I was born, but there was an immense amount of military influence in my childhood. Many family friends were veterans of WWII, the Korean Conflict and Vietnam. So I have spent much of this time talking with them about their experiences, and have an immense appreciation for the sacrifices they have made and difficulties they have gone through for our benefit. This past week marked the 65th anniversary of the famous flag-raising on Iwo Jima. Some of my time this past week was spent helping my father get ready to go halfway across the world. He is currently on a military tour with other veterans who are meeting in Guam. They will be visiting Iwo Jima for a ceremony honoring the loss of both US and Japanese life during that bloody battle. On an entirely different note, I am seeing the new musical Yank! at the York Theatre on Saturday, so there’s been a lot of WWII on my mind lately. I have seen practically every film about it, read numerous books – both fiction and non-fiction, and have seen countless documentaries about it. It’s been something I’ve been aware of ever since I can remember and my fascination continues. Posted on February 26, 2010 June 5, 2014 Author Chris Van PattenCategories UncategorizedTags James A. Michener, South Pacific, Tales of the South Pacific1 Comment on "Like Shiloh and Valley Forge…"
One of the most memorable moments from the opening night performance of Superior Donuts occurred prior to the actual show. I was at Angus having drinks with Steve, his partner Doug and Gil of Broadway Abridged, when on our way out we encountered upon the estimable Elizabeth Ashley. The actress was seated quite casually, drink in one hand, cigarette in the other and in a moment of pure nerve I decided to speak with her. Our conversation lasted five minutes, but it was one of most cordial, invigorating exchanges I have ever experienced with an actor. 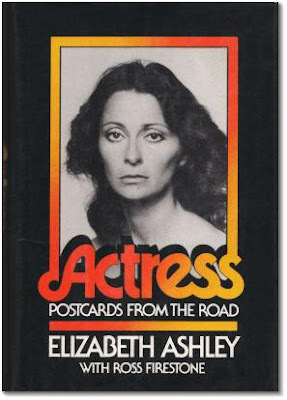 A couple weeks ago, SarahB gifted me a copy of Ashley’s long out of print memoir Actress: Postcards from the Road, that she had found while out shopping in Texas. 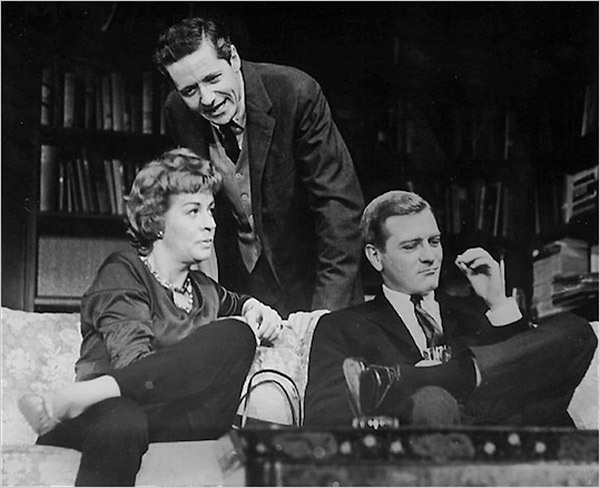 There were certain things I knew of Ashley – her Tony win and shoot to fame with Take Her She’s Mine, having Barefoot in the Park written specifically for her by Neil Simon and of her marriage to actor George Peppard. But – and this shouldn’t be as surprising as it was, but it is – there was a lot about the legend that I did not know. This book offered unusual candor in talking about the acting world of the 60s and 70s, and also regarding the struggles and challenges of being an artist of the theatre. She starts off with a breakdown during the run of Barefoot in the Park, where she felt she wasn’t good enough and sensed that everyone, especially co-star Robert Redford was aware of it. Highs and lows are traversed – the betrayal of her confidence by Sydney Pollack that cost her the lead in The Slender Thread, her volatile marriage to alcoholic Peppard, for which she gave up her acting career, the birth of their son, Christian, who really gave her the first real sense of identity she’d ever known. She left Peppard when alcohol started dictating violence and jealousy, culminating in an episode where she had to place a gun at the back of his skull to get Christian out of his drunken clutches. She had given up on her career after turning down the film version of Barefoot in the Park and needed to work from the bottom up to get back into shape as both a performer and a professional. This involved one-shot appearances on minor television shows and appearances in movies of the week; anything to get her back into shape and so she could earn her stripes. In one episode of Mission: Impossible, she challenged herself to work as hard as possible on a climactic scene, and the director saw the effort she was making and why she was making it and it really clicked. Her comeback was fully realized in her highly acclaimed turn as Maggie the Cat in the revival of Cat on a Hot Tin Roof that opened in Stratford, Connecticut, moved to Broadway and became the hottest ticket in town. However interesting her acting career, it is always the personal information that is the most fascinating; alternately amusing or harrowing. On the former path, she relays with considerable non chalance an affair with screenwriter Thomas McGuane. She and McGuane dallied for quite some time – with the full approval of McGuane’s wife who became one of Liz’s good friends. The three of them, taking sexual liberation by the horns and exercising their free love thought they had established the great sexual utopian experiment. Though she doesn’t mention her by name, merely a polite but terse “star-lette,” she mentions how Margot Kidder came along, snatched up McGuane ending his relationship with both his wife and Ashley. The harrowing – and one of the most personal stories she relays was a recollection of her first pregnancy, with actor James Farentino (also her first husband) in the early sixties. She was about to go into Take Her, She’s Mine when she discovered she was unmarried and pregnant. She recounts with grim precision the abortion she had, up to and including her need for hospitalization afterward. It’s a devastating, chilling account of what things were like in our not so distant society. And she does not hold back. Ashley takes is a no-nonsense, Southern gal: she suffers no fools but it brutally honest about herself and the events in her life. There is no glossing over her insecurities – from acting school, to the dismissal she received from her peers from the success of her first Broadway play (seen as commercial and not art). There is no stone which she leaves unturned in talking about her chosen profession, or the work she’s had to do and speaks of her successes and failures with considerable nonchalance. She doesn’t delve very deeply into her childhood or her family life – just glimpses here and there of an impoverished upbringing, her lack of education, etc. The book is more a window into her life as a reflection of her career; all the more interesting since she wrote this in 1978. Her career has continued steadily, becoming one of the prime interpreters of her friend Tennessee Williams’ plays and taking Broadway by storm last year in Dividing the Estate and August: Osage County. I had great respect for Ms. Ashley prior to reading her book, but now that respect has grown tenfold and I hope she might consider a follow-up. These last thirty years must have given this salt of the earth actress many more tales to tell. And I sure as hell would love to read about them. 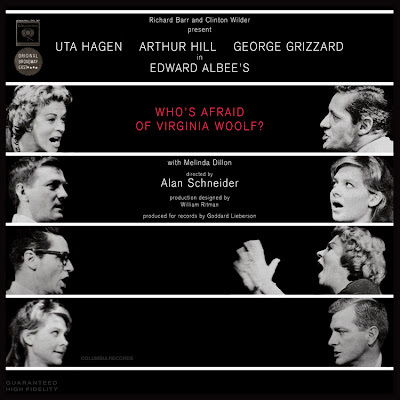 For the first time in years, I watched the 1966 film adaptation of Edward Albee’s Who’s Afraid of Virginia Woolf? starring Elizabeth Taylor and Richard Burton as part of my own “31 Days of Oscar.” In the time since I have last watched the film, I have gained a considerable understanding of the play through multiple readings of the text, two viewings of the phenomenal 2005 revival and (the apotheosis) the acquisition of the incredibly rare original Broadway cast album. The film does hold up quite well, in its text and especially in Burton’s brilliant performance. Oscar-winner Taylor is fascinating, once you get over the fact that she’s Liz Taylor and the makeup used to make her look older. She has to work harder than other actresses I’ve seen in the part but it’s still a worthy performance. George Segal is a bit too stiff as Nick, and Sandy Dennis is her usual otherworldly self in her Oscar-winning turn as Honey. Albee’s qualms about music and expansion of the play from its unit setting are merited, but those don’t detract from the overall experience. It’s said that screenwriter Ernest Lehman tried to rewrite some of the script, but the leading actors insisted on performing Albee’s text (with the exception of a couple of lines that Lehman contributed). However, while watching the film, I couldn’t get Uta Hagen’s Martha out of my head. Her performance in the original Broadway production has been regarded in textbooks as one for the ages, so I’d been curious about her work for years. Co-starring with Hagen were Arthur Hill as George, George Grizzard as Nick and Melinda Dillon as Honey. All four were acclaimed for their work, but it was Hagen’s performance that stood out from the rest. The actress and teacher received some of her best reviews (and a second Tony), in what would become the defining performance of her career. One of the most thrilling days to me as a theatre historian was the day I acquired the recording of the original Broadway cast, allowing me the opportunity to finally hear what all the fuss was about. Well, after seeing Taylor and Kathleen Turner (who was quite good opposite Bill Irwin), it amazed me that a mere aural capture of the performance could be so thrilling. My general opinion of the two booze-soaked leading characters in Who’s Afraid of Virginia Woolf? is that Martha is the showier role, but George is more interesting. But here on this album, as interpreted by Hagen, Martha is showy and interesting. Riveting, fascinating, gutteral. I’d never experienced any of her acting work before, just clips of her acting classes at HB Studios (she was married to Herbert Berghof until his death) and also from her interview in Rick McKay’s brilliant Broadway: The Golden Age documentary. It’s a titanic performance. It’s rare that an iconic performance lives up to its hype, but hearing Hagen tear through Martha, you realize that she is simply definitive. She is funny, vulgar, volatile and ultimately devastating. She pulls out all the stops as Martha, triumphant in an incredibly difficult, demanding role. The producers insisted upon matinee alternates for all four actors. Hagen didn’t want that – she wanted to do all eight. But it was probably a good decision that she didn’t. Matinees were performed by Kate Reid. Mercedes McCambridge and Elaine Stritch also played the role during the original production’s 664 performance run. But it is Hagen who is best remembered from this cast, and rightly so. Goddard Lieberson at Columbia was the one had the foresight to put the play on record, released in a 4-LP set. There were some who took issue with Albee’s text, as it made great use of various vulgarities not often heard in polite conversation (it’s believed that the controversy is what led to the denial of its Pulitzer Prize). That didn’t curb Lieberson, who was adamant about making the record. Even Albee didn’t think there would be a large audience for it, as he observed in comments he wrote for the LP booklet. But nonetheless, the performances were captured, complete with atmospheric sounds from their stage action, most notably the clinking of ice in their glasses. 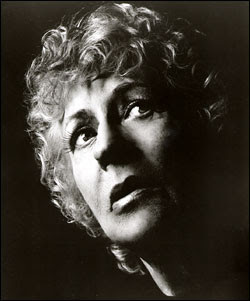 Hagen died in 2004, leaving behind a great legacy as actress and acting teacher. Before the stroke that ultimately led to her death, the octogenarian revived the role of Martha in a couple of staged readings of Who’s Afraid of Virginia Woolf? The evenings were to benefit the HB Studios, and actors held scripts. But the critics came out in droves and were full of superlatives for her performance. Thirty-five years removed, her performance was as prescient as ever. The album went out of print on LP and has never been reissued in any format. Rare copies can be found in Amazon z-shops and occasionally on Ebay. I have long hoped that perhaps one of these days it would be released; I thought the DRG release of the film’s soundtrack was supposed to be this first recording. I hope now that Masterworks Broadway is intent on paying homage to all the musical theatre recordings in its catalogue (of Sony & RCA) that they will consider issuing a remastered edition of this play. It is an original cast recording, an important documentation of one of the most iconic plays of the 20th century. Drama students would be well-served by access to this landmark recording. Act III, “The Exorcism” – “Our Son.” Since it comes toward the end of the play, I warn those that are unfamiliar with the piece of the possibility of spoilers. She was born Zelma Kathryn Elisabeth Hedrick on February 9, 1922 in Winston-Salem, North Carolina, and would relocate to St. Louis and finally Los Angeles. MGM was desperately seeking a rival for Universal star Deanna Durbin, a young soprano whose career unexpectedly skyrocketed after MGM let her go. A talent scout for Metro gave the teenage Kathryn a screen test and she reluctantly signed (she wanted opera, not film). After she signed her contract, she was offered the chance to sing Lucia at the Met, but was convinced by Mayer that she should turn it down. Grayson wouldn’t appear onstage in opera for years, though she would sing many of the famed operatic arias in her films. She would prove a cross-over artist as she brought much of the classical repertoire to film audiences, playing many characters were either aspiring or established opera stars or headlining numerous stage to screen adaptations. In many such films she was often paired with piano virtuoso Jose Iturbi, who served as an onscreen mentor of sorts. In The Toast of New Orleans (1950), Grayson would introduce the standard “Be My Love” only to be upstaged by Mario Lanza, who was the one co-star with whom she didn’t get along. Though I have seen better singing-actresses (particularly coloraturas) in the years that have passed since I first encountered Grayson, I hold a special place for her for being that first. Many of the roles she played are negligible, excuses for a beautiful soprano to sing. For what it’s worth, I think her finest moment onscreen was as Lilli Vanessi in the bowdlerized film version of Kiss Me Kate, it offers her the rare chance to be something other than an ingenue, and she really took the opportunity to heart. She was slated to star in the film version of Brigadoon, but her contract expired and Kate would prove to be her final film as an MGM player. She would make three more films, none of them very successful. The last, a Paramount produced adaptation of The Vagabond King, proved a misguided flop and one that Grayson herself admitted should never have been made. Grayson appeared in regional and stock productions of musicals and operettas after her film career waned, recreating some of her film roles in their original stage incarnations. She made only one appearance on Broadway, as a replacement Guenevere in the original production of Camelot in 1962 (where she reportedly sang the score up a third and added unnecessary coloratura flourishes). She would take star in the show’s national tour for almost a year and a half. In the ’60s, she also made many appearances in various operas with companies around the country. There were a few TV appearances, including a recurring bit as Ideal Molloy on Murder She Wrote. She lived in peaceful retirement, teaching voice and making appearances about her MGM days and taping a few recollections for TCM. Grayson was married twice. Her first husband was actor John Shelton, her second singer-actor Johnny Johnston. She is survived by her daughter Patricia Kathryn Johnston and several grandchildren and great-grandchildren.